The Dock and Dine is a casual eatery on Man O War Cay, Abaco, Bahamas. Chef Timmy and Chef Devan have worked side-by-side for more than nine years and have brought their unique culinary style to the Dock and Dine. All seafood has been locally caught and is fresh, not frozen. In my eyes, this gives new meaning to ocean-to-table – the freshest you will devour. Menu: The menu is simple, and encompasses both Bahamian and American favorites. Leaning heavily on seafood, you find fish sandwiches, conch burgers, and fish tacos in addition to chicken sandwiches and burgers. Main entrees include conch, fish, ribs, lobster and lamb shank. The menu also has fajitas (chicken, beef or seafood) prepared island style and pizza. The chefs have a “You Catch It, We’ll Cook It” policy. If you have been out fishing and want to bring your special catch in, Chefs Devan and Timmy will be glad to cook it up for you. Each dish allows the chefs to show off their culinary genius. Running daily specials give the chefs an opportunity to let their culinary imagination shine. A smattering of recent selections included coconut crusted snapper topped with a pineapple relish and served with coconut-saffron rice; the Tommy burger topped with bacon marmalade, mushrooms, crispy jalapeno and a bleu cheese spread, served with fries; and orange sesame lobster served with saffron rice. My Thoughts: Dining al fresco on the outdoor patio, you overlook the harbor. Nothing is better than a spectacular sunset as your backdrop during your meal. It’s always pleasant when the wait staff is happy and full of joy. Each of the staff we’ve encountered at Dock and Dine loves what they do, and their joy is infectious. Chefs Devan and Timmy have stepped out of the norm and created an appealing and luscious twist on conch with their Island Grilled Conch, one of their signature dishes. Tenderized conch that is marinated in Bahamian spices and grilled to perfection – this entree will leave you wanting more! Chef Devan loves to use tamarind in his spice combinations, so there is just a bit of spice in the Island Grilled Conch. Jim is always on the lookout for savory and delicious conch chowder. Stepping away from the traditional tomato based conch chowder, the chefs have created a delicious, flavorful conch bisque filled with tender, succulent conch and root vegetables. This dish is a must try. Save room for dessert! Our favorite was the Guava Duff Tart. With a shortbread crust, a tasty guava filling and topped with a crème-anglaise, this dish finished off our delicious meals perfectly! Conch Fritters, a must when dining in the Bahamas! Dock and Dine’s conch fritters are filled with conch and they are light and tasty. Wild Tamarind Shrimp are lightly battered and fried and then tossed in a tasty tamarind glaze with just a slight bite, and finished with coconut. Johnny Cake Chicken stuffed with apples and bacon and topped with a light thyme sauce will set your taste buds dancing! Cracked Conch is a staple in the Bahamas. If you’ve not tried it, you must! Paired with peas and rice, you are indeed eating native. 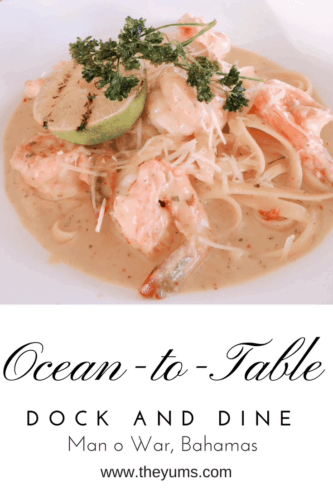 We think the Dock and Dine is one of the best restaurants in Abaco! The seafood is fresh and prepared perfectly. The ambiance is casual and laid back – the perfect place to come after a day on the water. Bring the whole family; kids will love the selection of burgers, sandwiches, and especially the loaded skillet fries! Open Monday through Saturday for lunch and dinner. If you are coming by boat, you can tie up at Man O War Marina, or catch the ferry from Hope Town, and spend the day on Man O War. If you’re looking for a hotel or guest house near Man O War Cay, you’ll want to read these TripAdvisor reviews, and then take a look at the comparison pricing on Hotels Combined. Price Range: $23 -$36 for entrees. Disclosure: This post contains affiliate links. Clicking through for additional information or to make a purchase may result in a small commission being paid, at no additional expense to you. By doing so, you help support this site and its authors, and we thank you.